carriewriterblog: My New Bay Area Business Woman Article Out! 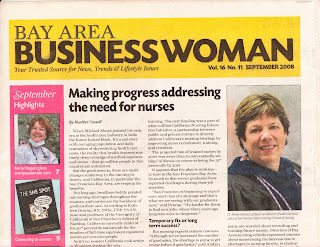 My New Bay Area Business Woman Article Out! My new feature focusing on women entrepreneurs and the big business of healthy beverages, is out in the September issue of Bay Area Business Woman. In the article, I discuss recent trends in this industry, with many women entrepreneurs taking on distributorships for healthy fruit oriented beverages such as MonaVie, as well as chocolate drinks such as xocai. Acai and antioxidants are in, high fructose corn syrup and sodium benzoate are definitely out. One interesting new trend are chocolate drinks, nutrition bars, and snacks with a low glycemic index, which means that diabetics can enjoy them as well. Interestingly, many of them are low fat and can provide the consumer with the energy they need, while also helping them lose weight! The importance of reducing sugar is crucial, as studies are showing rising statistics in the rate of diabetes amongst those women relying heavily on power juices, many of which can contain as much sugar and corn syrup as regular soda. I also really enjoyed interviewing Amanda Steele from Dreamerz, a San Francisco-based company which produced natural products which promote healthy sleep and relaxation. We writers are in a bit of a dilemma, as we have frequent deadlines and need to stay awake to finish! I try to stay away from caffeine, so when I need energy I look for natural fruit juices that don't contain too much sugar. I also try and avoid sugary snacks that just make you more tired once the "sugar buzz" is over. What healthy beverages do you drink to stay energized, or to help you get a good night's sleep? Is caffeine your main squeeze? As a former cappucino/latte/double mocha with whipped cream lover, I'm interested to see that studies have been done over the years indicating both the benefits and risks of caffeine. I wonder how many of you out there are drinking less coffee and caffeinated teas than you used to?